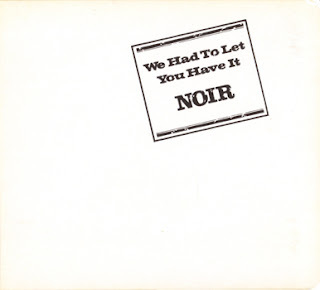 "We Had To Let You Have It" is the only recorded output from Britain's first all-black rock band, a band which broke up before the album was released. There is virtually no information about this group - that's about all the 'liner notes' tell us, that not much is known about Noir. I did find a page about Barry Ford, the drummer/vocalist, which tells us that Noir in their short career had gigs opening up for the Rolling Stones and Cream, and for a time were Alexis Korner's backing band. This page also tells us that the record was never completed but the label decided to release it anyway, hence the album title. This I don't get because all the songs definitely sound finished, and the running time is long for those days, a little over 48 minutes. Although these guys backed up Alexis Korner, the music on this CD isn't 'bluesy' at all. The music is understated and low-key, on a track or two the obvious comparison is the Chambers Brothers I think, maybe it's my imagination! The tracks are sometimes funky, sometimes smoky and inspirited, sometimes a tribal percussive thing pops up, all the cuts have a deep soulful feeling and the guitar playing is above reproach. Their version of "Indian Rope Man" is awesome, though the best track I think is "The System", which creeps over into jazzy territory. All in all this is a very sweet little album which deserves better that the obscurity it has had for thirty-something years. Thanks for let me know this record, two or three years ago, together with Bwana (I think they were posted sequentially). Nothing is wrong with the links!